This is a real simple project that is a lot of fun to make and use. It’s especially good for day camp projects or to keep kids busy for the day. This is the type of cooker shown on Mr. Wizard’s World in the mid-1980’s. I spent many summer afternoons as a kid cooking hot dogs in various solar ovens. Materials can be found around the house or by scavenging at the campus store… I found the school paper that no one reads to be especially useful. This is great for hotdogs, grilled cheese, S’mores, etc. Canned soup would be pretty good as well. I think it gets about 225-250 degrees F, though I’ve never put a thermometer in it to find out for sure. Cut the flaps off the top of the small box. Line with aluminum foil, making sure to cover all surfaces. You might want to secure it with clear tape, but it’s not necessary. 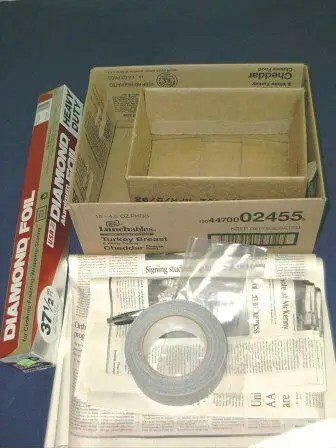 Seal all the seams on the large and small boxes with duct tape. Cut out a hole in the top flaps of the large box so the small box just fits. Fill the surrounding area with crumpled newspaper. Tape the flaps down securely with duct tape. 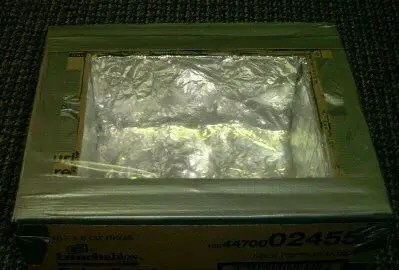 Cover the hole with the plastic wrap and secure with duct tape. 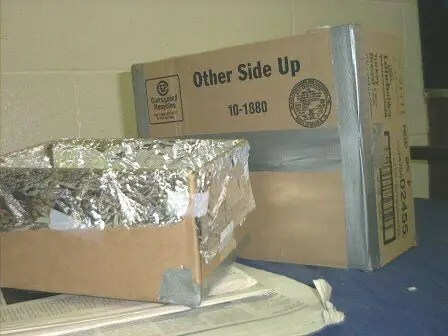 Make sure you fasten the duct tape in such a way to facilitate removal later or you won’t be able to put anything in the oven. Mr. Wizard, eat your heart out. A box with a lift-off lid (like the kind reams of paper come in) is great for this. The lid lifts off the plastic wrap so you don’t have to worry about replacing it. This is the way I usually make the ovens, but didn’t this time. Try putting something in the bottom that will absorb heat from the sun, such as black construction paper. You could probably make one with wood, mirrors, Plexiglas, a rubber seal and heavy-duty insulation. I don’t know how much hotter it would get, but it sure would be cool. If you put handles on it and padlocked it closed you could even leave it secured to something at the trailhead while you were hiking and have hot lunch/dinner when you returned. (I wouldn’t suggest this one in a high traffic area). Experiment a little and find what works best for you. Submitted by Chaz (not verified) on Sun, 2009-05-03 10:19. Submitted by yomamma123 (not verified) on Thu, 2010-09-02 10:11. Submitted by destini (not verified) on Tue, 2010-04-27 16:26.
hey thank you for putting this on here…cause if u didnt i didnt think we could fine a science fair project….hahaha thank you so much…. Submitted by susu (not verified) on Mon, 2010-04-26 15:01. Submitted by Anonymous (not verified) on Sun, 2009-03-22 20:38. Submitted by Anonymous (not verified) on Tue, 2009-10-27 17:53. This is awsome, i needed this for my project for school!!! I was thinking its due tommorow my projects due tomorrow. then i looked up how to make a solar cooker,i found this website and talked to my freind and said go on this website.THANKS!!!!!!!!!!!!!!!!!!!!!!!!!!! Submitted by Anonymous (not verified) on Mon, 2010-05-17 16:56. OMG!!! i am using this for a school project too. it’s great. thanks!!!! Submitted by violeta aparsheva (not verified) on Tue, 2010-10-12 00:24.
im using it for a project too but i dont get exactly how it wud work hot does it obsorb heat wen the top is sealed mith plastic and aluminum? wouldnt it reflect off of the aluminum? Submitted by yimplex (not verified) on Thu, 2008-06-26 03:20. Wow Thanks for your project.I’m getting to do this project after work in evening.I live in Thailand. (near equator) Our climate hot hot and hot suit for this solar oven.Thanks again. Submitted by Frogz (not verified) on Sun, 2009-06-14 08:38. 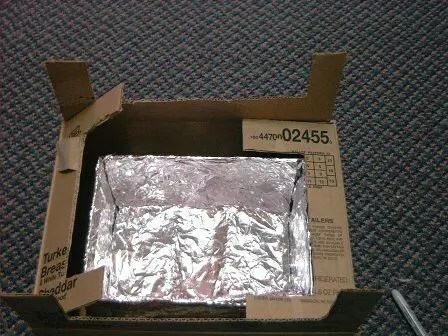 I also live in Thailand and I’m making a solar oven from a simple shoebox. I also want to try making one with a pizza box. It seems like a good environmentally friendly way to cook.